guess the secret vegetable ingredient! 1. Grate the butternut squash. Press between plenty of layers of kitchen paper to squeeze out as much moisture as possible. 2. Put the flour, cocoa, mixed spice and butter in a food processor and whizz until the mixture resembles breadcrumbs. Briefly blend in the sugar to mix. Add the grated butternut squash and egg yolk and pulse until you have a soft dough. Wrap in clingfilm and chill for 1 hour. 3. Preheat the oven to 180°C, gas mark 4. Line a large baking sheet with baking parchment. Roll out the dough on a lightly floured surface to 5mm thickness and cut out rounds using an 8cm cutter. Re-roll the trimmings to make extra rounds. Space well apart on the baking sheet. 4. Push a cake pop stick into the edge of each cookie, about two-thirds of the way through. Bake for 15 minutes. Leave on the baking sheet for 5 minutes then transfer to a wire rack to cool. 5. Cut thin slices of kiwi fruit and stamp out star shapes using a small star cutter. 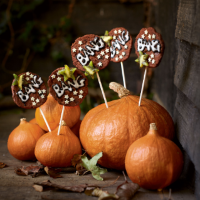 Pipe ‘BANG’ onto each cookie with the writing icing and secure the fruit stars and chocolate stars around the edges using a little icing. Leave to firm up slightly before serving. COOK'S TIPMake sure the cake pop sticks you have are suitable for baking. Otherwise, snip the point off sturdy bamboo skewers and use those instead.